This review was posted on the 27th of May at Flames Rising Dot Com, and was written by Todd Cash. 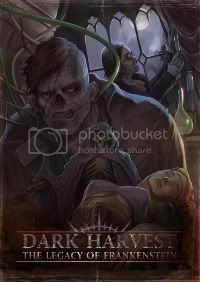 Dark Harvest is an alternative setting (compatible with Victoriana) from Cubicle Seven. In this pseudo-historic twist, Dr. Frankenstein establishes a seat of political and military power in the country of Promethea. This power base permits him to explore stranger scientific pursuits and achieve dangerous heights of hubris. Of course, things are far from well behind the curtain and PCs will most likely take part in the factions attempting to topple the status quo. The artwork, layout, and cartography in Dark Harvest has several more hits than misses. The art itself is great as is the cartography. The book proves to be a bit dull visually. There is a great deal of information in this book (information about the various areas of the country, the history, key figures, and much more). The point in mentioning this is that the information gets a bit textbook without more interesting breaks in the writing. In regards to the rich writing, few facets of day-to-day life were left unexamined. History, educational systems, religious structures, gender roles, and a wealth of other topics were laid out in an approachable manner. I didn’t care so much for the fiction padding the books in various places (there is a series of small pieces at the end of the setting material just before the book kicks over to rules and character creation. For me, the best writing fell to the development of the culture and history of Promethea. I’ve never had a chance to read or play Victoriana (though the time period is one of my favorites). I have, however, played Rippers. This book could easily be an expansion on that setting (one where things are going rather wrong for the PCs). The rule material permits excellent character creation and a strong lead into running a game with the book alone. The writing in this part of the book is also excellent. It’s a simple dice mechanic (D6s) for gaining multiple successes (oddly, ones and sixes are successes; sixes explode). Character creation is well-developed and has some fresh gems hidden within the talents (contortionist) assets and complications (annoying house mate). I personally enjoy the ones you can’t find anywhere else. This is a great book and setting. I wish I could share Victoriana’s importance to this. I may have enjoyed it more or less. I just don’t know. This is a fantastic setting for a Victorian sci-fi with hints of Big Brother and Nazi Eugenics. Yeah, Promethea is not a land where you want to make enemies of the established order. They know horrible things about the human body and how to abuse it in frightening new ways. You’d expect a dead character if he came down with his skin flayed back while a doctor played with his intestines. In this setting, it just means things are going to get interesting.